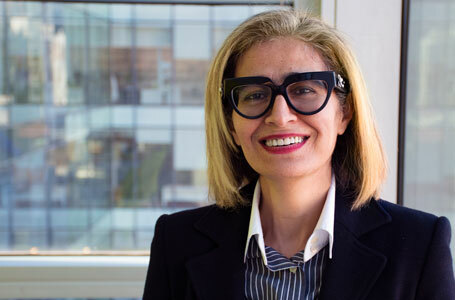 Since joining OICR in 2008, Dr. Rima Al-awar’s focus has been to build a drug discovery program that can efficiently help translate cancer-related academic discoveries from Ontario’s scientific community into novel oncology therapies that will benefit cancer patients. She has endeavoured to build a team that complements the requirements of Ontario’s academic community and the team is now comprised of researchers whose collective expertise spans the entire drug discovery process from target identification and validation to clinical candidate selection. The group has extensive experience within pharma and biotech environments and combines the biology, ADME/PK, analytical, medicinal and computational chemistry expertise with the state of the art infrastructure necessary to successfully advance drug discovery projects. The major goal of the Drug Discovery group is to help translate the most promising ideas coming from Ontario’s academic community into therapeutic benefits to cancer patients by identifying hits and lead molecules and optimizing them to potential drug candidates. Tu WB, Shiah YJ, Lourenco C, …, Al-awar R, …, Penn LZ. MYC Interacts with the G9a Histone Methyltransferase to Drive Transcriptional Repression and Tumorigenesis. Cancer Cell. 2018; 34(4):579-595.e8. Medrano M, Communal L, Brown KR, …, Al-awar R, …, Rottapel R. Interrogation of Functional Cell-Surface Markers Identifies CD151 Dependency in High-Grade Serous Ovarian Cancer. Cell Reports. 2017; 18(10):2343-2358. Hammoud L, Adams JR, Loch AJ, …, Al-Awar R, Egan SE, Rossant J. Identification of RSK and TTK as Modulators of Blood Vessel Morphogenesis Using an Embryonic Stem Cell-Based Vascular Differentiation Assay. Stem Cell Reports. 2016; 7(4)787-801. Getlik M, Smil D, Zepeda-Velázquez C, …, Al-awar R. Structure-Based Optimization of a Small Molecule Antagonist of the Interaction Between WD Repeat-Containing Protein 5 (WDR5) and Mixed-Lineage Leukemia 1 (MLL1). J Med Chem. 2016; 59(6):2478-96. Grebien F, Vedadi M, Getlik M, …, Al-awar R, …, Superti-Furga G. Pharmacological Targeting of the WDR5-MLL Interaction in C/EBPα N-terminal Leukemia. Nat Chem Biol. 2015; 11(10):815. See Dr. Al-awar’s recent publications on PubMed. To inquire about our medicinal chemistry expertise and resources please visit: OICR’s Collaborative Research Resources directory.